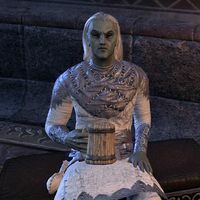 Dredase-Hlarar is an Ashlander Dunmer from the Zainab Tribe who can be found in Saint Delyn Plaza in Vivec City. "Greetings, Outlander. There are far more of you than I expected." "I sense you know of our plight. Have you come here to help my tribe?" I was told you have information on retrieving items from Nchuleft. "The Zainab tribe has worked within the ruins for generations. We were recently driven out by a band of Ashlander exiles, and do not have the skills or warriors to take it back. It is a blessing that the Temple agreed to help." Why do you need me to collect these items? "Before the attack we had already gathered items for shipment. I believe these particular pieces are of great value, and I hope selling them will get my tribe back on their feet. The task may be dangerous, but it is our only chance to move on." Can you tell me more about Nchuleft? "The history of the ruins have always been a mystery to my people. I can tell you no more than our own eyes will see. You will meet with exiles when you first enter, but I doubt they have found a way to control the constructs found deeper within." What kind of work did your tribe do in the ruins? "Some Ashlanders farm the land, others hunt. My tribe harvested Nchuleft for parts and tools of value. Through trade we were able to make a living this way. Now that the exiles have hold of the ruins I'm not sure what we'll do next." "I see triumph in your eyes and hear metal in your bag. Have you brought what I asked?" I brought the items you asked for. "Thank you, Outlander. Hopefully I can sell these items for a fair price to some scholars within the city. Not that I'm too worried about haggling, mind you. I've been at this for a long time. Keep the ash from your eyes." "I did not think an Outlander would be so willing to help an Ashlander tribe. We do not have much, but you are always welcome to our fire." 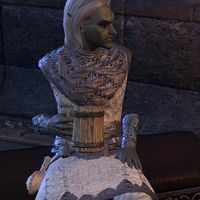 An animation glitch will sometimes occur whereby Dredase will appear to have no upper arms (but still has hands) ? Typing "/ReloadUI" fixes this bug. This page was last modified on 12 February 2019, at 01:33.